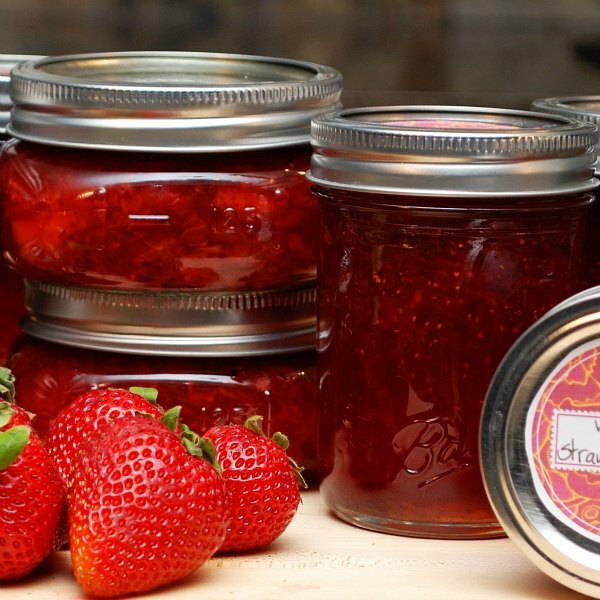 For the most part, canning is a very safe and simple process. If you follow the rules, you have nothing to fear and you get some delicious food that can be eaten in the off-season. Please Don’t Be Afraid to Can! I don’t want to scare anyone off from canning – just the opposite! You just need to understand that is NEVER okay to cut corners (especially with low acid foods such as veggies & meat). So in this post, I want to cover the basics of safe canning and explain the science behind these rules. And for the record, I am not just basing what I say here on my “experience”. Yes, I am a life-long canner, but I have also been through Master Food Preserver training through county extension and attended professional cooking school. All the recommendations here are based on the USDA requirements for safety. If you are armed with a clear understanding of how the canning process works, you will feel confident and safe in all the preserving you do. High acid foods include jams, jellies, pickles and marmalades. These have a pH below 4.6 and are considered the safest and easiest things to can. Jam, jellies, marmalades, pickled products, acidified tomatoes and whole fruits fall into this category. They are considered “safe” because their pH level prevents the scary toxins from forming. In other words, you cannot get botulism from a properly canned high acid food. It simply can’t grow there. Since the botulism spore cannot grow in the high acid environment, you don’t have to worry about killing it with a super high processing temperature. Instead, you just need to kill molds, yeasts and bacteria that can cause spoilage. And these are easily killed at the lower temperature achieved in a boiling-water canner (aka: water bath canner) – where the food is brought to 212 degrees F, the molds/bacteria are killed and a vacuum seal is created when the jar cools. The pH level of the finished product takes care of the rest. Click here to learn more about water bath canning including altitude adjustments to recipes. You can make jams, jellies and pickles to your hearts content and as long as you follow the recipe, you can sleep well knowing they are extremely safe. They are perfect for beginners and advanced canners. Now here is the important part: The botulism toxin CAN easily develop in a pH level above 4.6 when it is in the sealed environment of a canning jar! You cannot taste or smell botulism when it is present in a jar and it is deadly. So in order to ensure safety, you must kill all spores at a super high temperature (240-250 degrees F) for an extended period of time. You can ONLY reach that temperature with a Pressure Canner. You MUST process all low acid foods (like plain vegetables, meat and soup) in a pressure canner and follow modern instructions properly or you can get into trouble. If you don’t feel you are ready for this, stick to jams and pickles instead. Pressure canning is different from water bath canning and uses a pressure canner. People get confused about pressure canners, which is understandable. 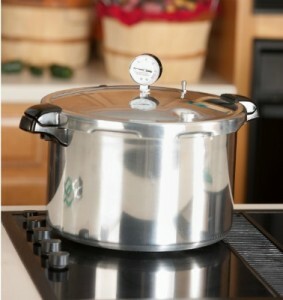 A pressure canner is NOT the same thing as a pressure cooker (which is used to cook food quickly). A pressure canner is made specifically for canning and comes as either a weighted or dial gauge model (or both). It processes the jars under pressure which allows it to reach a much higher temperature than you can reach normally. Water boils at 212 degrees F, but a pressure canner takes the food to 240 degrees F and above. If you want to use an old pressure canner that is handed down or that you found at a garage sale, I highly recommend that you have it thoroughly checked out through your cooperative extension office before using it. First, it needs to be new enough that it has a UL approval for safety with the fancy pressure release valve, etc. Second, things like gaskets and safety valves can have issues over time so you need to verify that yours are sound. And third, a vintage pressure gauge must be checked for accuracy. In fact, you should have the gauge on any pressure canner checked every year at your local county extension office or hardware store. It is easy to do and is important to verify it every year. A gauge that is off will either under-process (dangerous) or over-process your food – making it unappetizing. So if you are going to try pressure canning, buying a newer (modern) canner is really a better option rather than a very old one used by your grandmother. Yes, it can be “used”, but it needs to be a modern model. Yes they can be expensive. But they are also lighter weight, have fewer issues or problems, are very safe (UL approved) and they will last for a lifetime of canning. You can learn more specifics about using a pressure canner HERE and HERE (with altitude adjustments). Heirloom recipes should be checked for safety before using. When people tell me that they always water bath can their green beans (a low acid food) just like grandma and “Well…no one ever dies!”, I shudder. I also point out that I know people who smoked their whole lives and never got lung cancer. But that doesn’t mean, given what we know today, that we should take up the habit and assume we are perfectly safe. We know so much more now than during our grandparent’s time and therefore, we need to use that knowledge to ensure safety. Don’t take unnecessary risks. 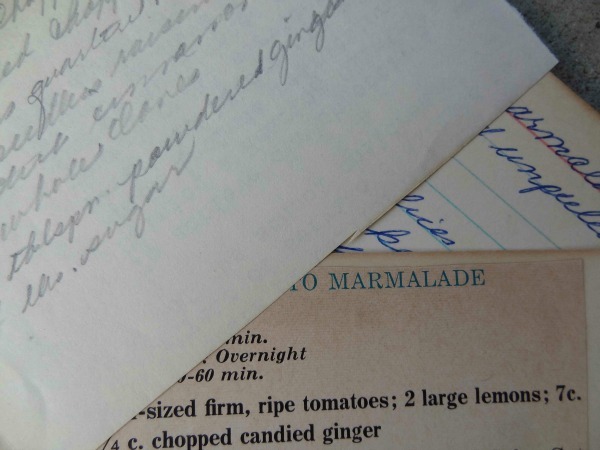 A recipe that belonged to your grandma or great-grandmother may be perfectly safe. But it also may not have a proper processing time or method. So to be sure, just have it checked by a Master Food Preserver at your local county extension office. There are usually minor adjustments needed, such as extending the processing time or adding an acid to make it safe. And then you can still make that heirloom recipe and feel the connection to your heritage safely. 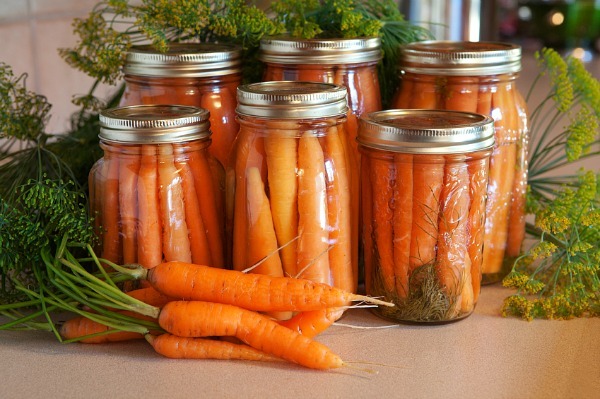 Whenever you preserve food, use modern recipes from a reliable source such as the National Center for Home Food Preservation or a canning author or blogger who specifies that they use modern USDA guidelines. Then you will be free from worry and can concentrate instead on those delicious canned flavors! I didn’t initially include a mention of fermented foods in this post because they are not always “canned”. (Doing so kills all that good bacteria that you worked so hard to create in the fermentation process.) But people often wonder if they can get botulism from fermented foods like cabbage or meat. The answer is NO. You cannot get botulism from fermented foods. Botulism needs a low acid and anaerobic environment to grow. The fermentation process creates lactic acid and you have the addition of salt to prevent any bad bacteria from growing. And when fermenting on the counter, it is not sealed in an anaerobic environment. You can feel safe with fermented foods. Also, you can process (or “can”) things like fermented pickles and sauerkraut (when they are finished) in a water bath because when it stops fermenting it is now a high acid food. Just follow a USDA approved recipe for proper processing times. I will write more about fermented foods in a future post. I live in the UK and am desperate to pressure can various foods. Unfortunately this appears to be a method of preserving which seems to have died put here. It is so good to see many people do this in the USA and Canada and with such a passion! Hi Theresa,enjoy your comments. My question concerns canning green and wax beans. The beans have been very soft to the tooth after I open a quart to eat. Is there a processing technique to keep the beans a little more crisper? I want to can them instead of freezing. I appreciate any help in this matter. I follow standard procedure by cleaning the beans, blanching from 3-5 minutes, ice bathing, then into the jars, topped off with boiling water before sealing and pressure canning at 10 psi for 25 minutes. I canned tomato juice yesterday and I had a lid “pop” seal before the water bath procedure. I wasn’t sure if that was what I heard. Anyway, I went ahead with the water bath and I only heard 4 out of 5 pops. I Checked all the lids after about 12 hours and they are secure and no movement in middle. The jars were hot out of the pan after sanitizing them and the tomatoes were coming off the stove after boil them. Is the early seal safe to store in cupboard? Do I start all over with the 5 quarts since I’m not sure what lid sealed early? Your early seal is just fine. You did the right thing by continuing the process. That first pop was okay. Your water bath procedure would create a stronger vacuum on the seal. It should be fine as long as they all feel secure with no movement. You did it right! Love this article since I just started canning. I made 12 pints of pinto beans “Boston baked style” and they soaked up some of the liquid. I have 2 jars only have full and the rest are 3/4 full. Are they still going to be okay? I did pressure can them for the correct time and fallowed the recipe. If you followed everything properly, the ones with just a little bit of liquid loss should be okay. (The food above the liquid line will darken quite a bit so use sooner rather than later). However when you lose 1/2 or more of liquid, you really need to refrigerate the beans and eat within 2-3 days. I have always c ooked my base soups, then froze them..I was told that since I COOK the soup that water bath canning will be fine. I add meats and seasoning right before they are eaten, so I can use the base soups for variety..Is this gonna kill us? Cooking the soup first does NOT make it okay for water bath canning. Not even close. So don’t do it! Without pressure you can only get the soup to the boiling point and that is NOT hot enough to kill the botulism spore. If you do not want to pressure can the soup, then continue to freeze it. That is a very safe and reliable method. What would be the best time/weight for pressure canning white chili? My recipe mainly consists of great northern beans, white and dark meat chicken, diced whole onion, fresh crushed garlic, roasted pablanos jalapeños and chilis, various seasonings such as cumin, paprika, fresh cilantro and fresh chicken stock. I feel silly! Just read your article on water bath basics and I think that botulism isn’t a concern for my pickled peppers, just mold and bacteria? How long will my quart size jars be shelf stable at that processing time? I really don’t want to refrigerate 5 jars……no space in the fridge. Thank you for your patience with my questions!!!!! If you can half runner green bean by the water bath method, when you open the jars to cook and serve them — if you cook them very well before serving , does that prevent botulism? It would all depend upon how they are cooked, for how long and if the heat penetrates to the center of the bean for a sustained amount of time. If done wrong, you very well can sick. So I was told I needed a pressure canner to can meat – yet I bought a pressure cooker/canner that says I can safely can meat in that. Are the newer pressure canner/cooker combos safe for canning meat? It has a weighted gage is all and is a Presto canner/cooker. The confusion comes where people buy a pressure cooker only – which is made for cooking food, not canning. A pressure cooker cannot can food in canning jars. But a pressure CANNER, may be used to can food and/or pressure cook food. They are dual purpose. I pickled some peppers but didn’t put them in a hot water bath. Can I go back and do it now? They did seal. Hi Debi – USDA recommendations state that you can only go back to water bath seal if done within 24 hours. You can put them in the refrigerator and keep an eye on them for spoilage. I am sorry to say I made four gallons of salsa (my sister’s recipe, not approved, hardly any acid added, recipe included lots of peppers, onions, corn, garlic) and water bath canned it… That was a week ago. Even though the salsa was thoroughly cooked for hours before canning and everything sealed, I have to throw it out, don’t I? :'( I have been researching to see if there is a way to salvage it, but I’d rather throw it than get sick. Also, my sister uses corn starch in her salsa. Is that safe? Just based on what you are saying here (lots of veggies, no acid), I would not feel comfortable keeping it or trying to reprocess it after that long. If the botulism spore was in there, it is a prime situation to reproduce. Hi, I just wanted to thank you for this article. I’m a first time canner this year, only doing tomato products and jams, but I have literally been having nightmares over the possibility of poisoning my family. However, after reading this article, I feel so much better, I know I’ve done everything correct, and I now have confidence that everything is safe to consume! Thanks again!!! You are welcome Lori. Glad to help. I had a question about canning dry beans, such as pinto beans. There are many videos showing how to put one cup of dry, unsoaked, uncooked, beans in a quart jar then adding various spices, various pork products and hot water to one inch fill line. The jars are then pressure canned for 90 minutes at amount of pressure for your elevation. My question is, all my recipes show cooking the beans for a period of time prior to canning. I admit, it would make it easier to achieve proper bean/liquid proportions in each jar, but I question the safety. Also, thank you for taking the time to ‘teach’ proper canning techniques. I’m afraid I can’t answer to the safety of that particular recipe because I have not seen it. But I can say that I do have a USDA approved recipe for plain lima beans that is not cooked (raw packed) and pressure canned. However, you say it has “various pork products” and I am just not sure what else is in the recipe. So, I can’t really answer. I found a recipe for canning venison chili with beans. I pressure cooked 90 minutes at 10# pressure. Most recipes I see only recommend pints. What are your thoughts on this? You didn’t say if used pints or if you used a larger sized jar but it sounds like used larger than pints. Does the original recipe called for the pints to be done for 90 min and 10# and you used a larger jar for the same time and pressure? Or are you just asking if you can move this up to a larger jar? Ground venison is done in quarts for 90 minutes at 10# pressure. But I do not have a chili recipe to compare. If you feel you have a recipe that follows USDA guidelines, I would stick to the sizes, times and #s pressure they recommend. When it comes to low acid foods, I don’t mess with it – as making a mistake can make you very ill. I have canned with one of my dear friends for years. Tonight she made spaghetti sauce “a LA the kitchen sink” and water bathed it. Botulism is not a joke. If you close your eyes and ears you might not get it. But if you open your mouth and allow unsafe practices in your body you could die. I am a chef and and happily in the middle of another bumper crop from my garden. I examine my pressure canner every year. I get the gauge tested every two years. Despite my huge ego I follow every recipe To The letter by experienced tested recipes from experts like ball. There are some recipes on line that say they’ve been pH tested. I don’t use them either. Use your published recipes. Use your canner correctly and you will have wonderful preserved food. If you don’t know what you’re doing please don’t give it as gifts. Hi. I have just started experiencing canning. I love homemade veggies soups. I don’t have a pressure cooker. I made pinto bean soup and water canned them and they sealed beautifully. I have 12 pints of them. it was last week on 8/12. now that I am reading about having to pressure cook beans, is it too late to open them and get a pressure cooker to can them?? I’m sorry to say that yes, it is too late. You have the risk of botulism spores multiplying at an exponential rate inside that jar. A week is plenty of time for that to happen. You cannot taste or see botulism. So do NOT taste that soup. You need to throw it out. So sorry. Thanks for the helpful article! Could you briefly discuss or provide a link to pressure canner safety? I’ve only assisted water bath canning before, but would like to start canning homemade stock since it takes up limited freezer space. I understand it would require pressure canning, but I’m seeing a lot of horrible information about pressure canners exploding. What are some safety tips to avoid this? Thanks! If you buy a new canner, it has very good safety features built right in that prevent explosions. The older canners did not have this. Pressure canners are very safe as long as you do not leave them unattended. My tip is to not use one and then forget you have it going. 🙂 You need to keep your eye on it. It is a big topic and more than I can cover here in the comments. But the USDA guidelines will help. I canned several quart jars of green beans in a pressure canner. I made the mistake of running cold water over cooker and not letting it come off pressure on it’s own. This resulting in water leaving the jars and beans not fully covered. They are sealed. Some are full of water some half and done in between. Can I open these replace with new seals and cook in pressure canner again? I know the beans are safe now. I just prefer for the water to cover all the beans. Yes Lori – I would do exactly that. You are correct – dropping the pressure/temperature rapidly causes siphoning of the liquid inside the jar. Having just a little bit of veggies above the line is not a problem. But having a jar half full is a problem and I would redo them. Hi Renee – I am not familiar with “sea salted beans” so I am unsure how to answer about their safety. Be careful about tasting something for safety. If you are every worried about botulism, do not taste. Botulism cannot be detected by taste or smell and if the food is contaminated, you will get very, very sick from a taste. Otherwise, with general spoilage, you can usually tell by smell that something has gone bad. As for the mushrooms and beets, they can be pickled with a brine of at least 50% vinegar and water bath canned. I am unsure about the olive oil used in a pickle. You may need to ask your local extension office about that one. Hi there. 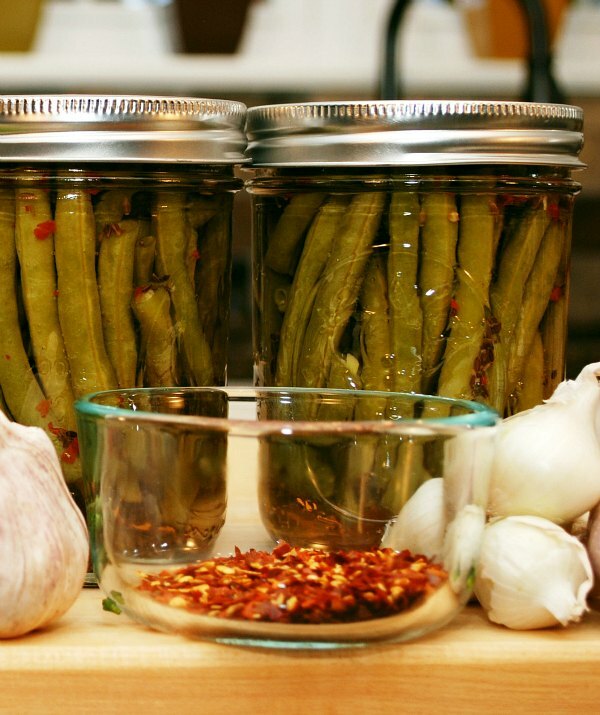 I ran across this blog as I was trying to do some canning for the first time…of course I bought green beans from a small stand where the person mentioned hot water bathing them and so I assumed it was just as safe as with a pressure cooker. Once I started, I talked to my Mom who clued me in…I ended up freezing the beans. I bought more beans from the lady today and she seemed surprised it isn’t ok to hot water bath beans. She said she has always added a 1/4 teaspoon of lemon juice to her beans. So, I thought I would try that. The problem is I just don’t feel safe doing this, so here comes my question, lol: I have hot water bathed and sealed my beans for 20 minutes with a bit of lemon juice in them ( I hope that doesn’t taste awful and that was 5 minutes longer than her time), can I purchase a pressure cooker say tomorrow and then pressure cook them again to make sure they are “safe”? And how long should I cook them at that temp? I sealed them at a rolling boil with a lid and fully covered with water. Sorry…first time canner who thought this was WAY easier than it really is, lol. I’m sorry you got poor information from the farm stand. Your mother is correct (don’t you hate that?) about beans only being pressure canned. The bottom line is that you should never water bath can beans (even with lemon juice). It just isn’t that simple. Yes, people do it and brag about how they never get sick. But the science is pretty clear that you are taking a risk. I’m not a gambler, so I don’t do it. As for buying a pressure canner and then reprocessing them, yes you can do that. But the entire process of pressure canning is more than I can easily explain here in the comments section. Your pressure canner comes with a detailed booklet and there will times and pressures listed there for the size jar you are using. When I get an unexpected batch of green beans, I prefer freezing. It is fast and easy. The only down side is the freezer space. I have a question, I’ve always used a water bath for applesauce’s or jams ect. I saw a pressure canner/cooker at a yard sale. I can’t really afford a new one right now as I’ve been pricing them. I’m still very new to the whole idea of canning and understanding it. This one has no gauge but what I believe is called a petcock but there is no weight ect on it. I did try to can a jar of water just to test out the pressure canner, it did seal and it steamed out of the petcock and slightly whistled. My question is for you, how can I tell if this works or not? I have a deep fryer thermometer that I placed in the pressure cooker and it read it was 280 degrees. I know for safety reason the temp has to read 240 or above. So is this safe to use to can beans and veggies?? I’m sorry that I can’t be more helpful. What if I added a tablespoon of lemon juice to each quart of green beans, would it then be safe for water bathing? No. That would not fix the pH problem. I love pressure canning. Have never used the water bath method, and don’t really want to. My question is, if pressure canning beings water to a higher temp. Can I pressure can all things, instead of doing the water back method? For instance. Salsa. Yes Kim you can totally can from a safety issue and Salsa works beautifully pressure canned. Some things may get over cooked a bit from the higher temperature and may lose texture (such a pickles which may not be as crisp). But other than that, yes. Hi. 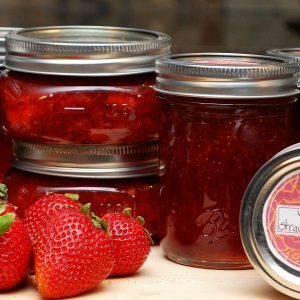 I am new to canning and I do have a question regarding homecanning that I can’t find an answer for. I processed green beans on 7/30/2014 and many of the jars water level was reduced to half. I learned why after reading about this online at various sites. I read everywhere that the food is still safe but to use those jars sooner rather than later and that it was not necessary to add water to the sealed jar and to just leave it as is. Today, I processed another batch of fresh green beans , August 6, 2014 and one jar did not seal. I replaced that lid with a new sterilized hot lid and band but didn’t want to just reprocess that one jar alone in the pressure cooker. I remembered the previous jars from the prior week with the low water levelsl and decided to reprocess them too just because I wanted those beans covered with water still to prevent discoloration, etc. I opened those, one at a time, and they all were nicely sealed as evidenced by the loud popping sound when I got the lid off. I then ladeled hot boiling water over the top of the contents so the liquid level was now covering all the beans and left 1 inch headspace. I recapped with new, hot sanitized lid and new hot band and repeated this for 5 other jars of green beans and I did this quickly. I did not do anything else except wipe the rim well with damp cloth before applying new lid. I reprocessed jars and they have sealed. So, my question, after this lengthy step by step explanation is this: Is this ok to do? I did not reempty the green beans out, into boiling water again and put them into new clean jars again. They were previously sealed and I unsealed them, added more boiling water to cover the beans, wiped the rims and applied new hot lids and hot bands. Please let me know what you think about this. I did reprocess them again, for the full 25 minutes in the pressure cooker. I simply wanted the water level to cover my beans all the way! Thanks! If we look at this carefully, I think (based on what you are telling me here) that the beans are safe. They were processed properly the first time and they sealed. They remained sealed until you opened them, added hot liquid and reprocessed them again with new lids. You used a pressure canner which is the proper way to can green beans and you processed for the proper time for quart sized jars or smaller. It is okay that you did not reheat the beans, because you can process raw packed beans at the same processing time (and raw beans are not heated). I think you did a perfect job and should pat yourself on the back for being such a careful canner. Good job! All of these will cause the fluid to leave the jars. Remember, it is a pressure vessel, if you cool it down quickly what you have now is a low pressure inside the cooker compared to the jars, which are still boiling (high pressure), thereby forcing the water out of the jar. It is perfectly safe to leave the beans in the jars with half the water out. They will change color somewhat but if they are sealed they dont need the water. They will be perfectly safe to eat. When using a pressure cooker, you MUST allow the interior of the cooker to cool to below 212 degrees (the boiling point of water at sea level) before you attempt to cool it, or remove the weight, or release the pressure. this ensures the inside of the jars is also below 212 and the pressure both in the cooker, and in the jars is the same causing no pressure differential to force the water out of your jars. Hi, I loved this article and the comments it has given me a lot more confidence in my pressure and water bath canning practices. my question is this; I have a lot of cucumbers on the vine ready to pickle, more than I could reasonably store in my fridge,… I want to can them in a water bath after fermenting (even though I’ll lose the bacterial goodness) will they stay crispy? I am also wondering how I will know when they are “done fermenting” and if I should leave the tannin leaves in the jars when I seal and can them. hope you can help….so many cukes!!!! I find that canning the pickles will lose a little bit of crispness. I believe this is due to them getting heated (and slightly cooked) in the process. They are not ruined – it is just that the finished canned pickle is a bit less crisp than a freshly fermented pickle. Many people leave the tannin leaves in the jars when they can. I’m not sure how much they continue to work at that point, but it certainly doesn’t hurt, so go ahead and do it if you wish. Can you water bath peppers if you are canning them in vinegar and water? Any veggie can be water bath canned if it is a pickle. Using at least 50% vinegar would make them so. I love pickled peppers. I add a little whole black pepper to mine and sometimes a garlic too. thanks.. I cant find anything but pressure canning when I search!! The reason you won’t find a beef recipe that is water bath canned is because doing so is very dangerous. You can get botulism poisoning. Here is a post about it and you will note the link to someone who water bath canned meat and almost died. You must either freeze meat or pressure can it. I am new to pressure canning and have been enjoying so far. One question, many of the receipes say to cook the contents first. For instance for a beef vegetable soup. Since the contents cook inside the pressure canner is this a necessary step? Is this a safety issue or just to blend the contents? It seems like this extra cooking will just turn contents to mush. Hi Debbie – It is most important for the contents to be hot when added to the jar. They do not need to be cooked all the way through per se. You are correct that they will reach a temp inside the jar during processing and if you feel that the contents will be over cooked, I think it would be okay to heat the contents well and then fill your jars. In the case of meat, recipes will call for it to be cooked to a certain point before processing to assure there is less bacteria, etc. I have a pressure canner and use my blue ball book for all my canning. I am having a problem with the liquids boiling out of the jars while under pressure. I called a hotline and they said I was tightening my lids too tight I tried only tightening them to the first sign of resistance as they said but it still happened am I cooking under too much pressure? Another thing that can cause syphoning like that is the temperature and/or pressure dropping too quickly. Next time, let the canner sit over night before opening it up to remove the jars. I bet that solves the problem. Even though you may be following the time listed in the recipe exactly, many times it needs a slower drop down after the processing time is over. I would not adjust your pressure yet as that can compromise your safety. Try the over night cool down instead. Can I use the water bath method to can jalapeno peppers, banana peppers, Serrano peppers and tomatoes? I also want to can candied jalapenos. You didn’t tell me the size jars you are talking about canning. Are we talking 3-5 pint size jars are 3-5 quart jars? The 21 quart capacity pressure canner (like the one you reference) is the most popular one sold. BUT that is because most people don’t want to bother with pressure canning unless they are going to do a big batch. The 21 quart is probably over kill if you only do small batch recipes. When picking your size, consider what you will be doing in the future with your canner. As you gain confidence with it, you will probably be doing all kinds of recipes – especially soups. And that would be more like 4-5 quart size jars. Then, you may move into large batches of vegetables and that would fill up 5-7 quart size jars. Are you asking if she needs to cover the jars with water inside the pressure canner? Answer: No. She does not need to cover the jars with water. A pressure canner only uses a few inches of water. Or are you asking if she still needs to heat the jar LIDS in water before putting them on the jars and into the canner? Answer: Yes. The rubber seal of the lid still needs to be softened in hot water before putting on the jars. If I did not answer your question, write here again. Can I use a pressure canner to do water bath canning too? All you need to do water bath canning is a tall stock pot with a rack or tray in the bottom to hold up the jars. So, yes you can use your pressure canner in that way with the lid off. My daughters and I want to “can” some things. We are not sure what and we do not know how. I am trying to learn a lot before we tackle this project . From what I have read it appears that canning can be dangerous, we are going to have an aunt that has done a lot of canning watching us. I’m glad to hear you are diving into canning. It is wonderful that you have someone to mentor you. It sounds like you will have a great time. Yes, you can put up figs. I use them to make a jam every year. They are quite sweet and most recipes use a lot of sugar. I would suggest that you use a low-sugar recipe (google it) and let the fig flavor shine through. You will love them. This is my first year canning and this article helped me out a lot. I have already purchased a pressure canner. I don’t have a stock pot and rack for a water bath, but I wondered if I needed one for high acid foods or if I would be able to use my pressure canner? You can use your pressure canner as your waterbath canner. It will work fine except you have to follow a little bit different technique. Teresa, I made the same mistake someone else asked you about. I canned some soup and sauces fully cooked with meat in them using the water bath canner. All sealed properly. But after researching ways to can meat and found out I have to have a pressure canner which I now plan on purchasing,, I ran across information that says you also need pressure canner for Vegetables and soups. I was considering re-canning in a pressure canner and you said NO. My question is -Is there anyway to tell if I open the jars if it is safe to eat now? A test for botulism. I’m sorry to say that there is no test you can do for botulism. You cannot see, taste, or smell it either. That is why it is so dangerous. And once the toxin has developed in the jar, boiling the product will not stop the botulism either. Meat products that have been waterbath canned instead of pressure canned are prime targets for botulism. The fact that they all sealed properly is what creates an anaerobic environment and that is what the spore needs needs to develop the toxin. I’m afraid your safest plan of action is to throw them out. So sorry! Thank you for this article! Unfortunately, judging by the comments, it seems people didn’t actually read it. Ha ha Amanda – Well, I think the problem is that people are in a hurry and read the first paragraph and then ask their question. Oh well! The info is there for them if they need it. Thanks for stopping by! I just bought a pressure canner I am a novice water bath canner. Now I see you saying you cannot use a flat top stovew with the pressure canner? That is what I have. What can I do? I put up 7 pints of homemade venison & beef chili on Dec. 14, boiled & sealed properly. Problem being I used a hot water bath. Would it be safe to pour the chili back into a pot, re-boil and properly can now that I have a pressure canner? I’ve never even thought about cooking veggies to be canned, let’s say in the jars with water, in a 350 degree oven, boiling for half an hour or so, putting lids on and boiling for another half hour in a hot water bath with the bands on? No pressure cooker. Comment? Rick – Absolutely not. What you are proposing is very dangerous for many reasons. Please refer to the articles below on canning safety. Also, I would never put jars of veggies in a 350 degree oven. That is dry heat. The jars need wet heat or they can explode due to the extreme temperature differentials that can occur. Can a pressue canner be used as a pressure cooker? Yes, but the reverse is not true. So, let me spell it out so that no one gets confused. A pressure canner is build to “can” food but it can also pressure-cook food (which is done at a lower pressure). However, a pressure COOKER is different and can only be used to cook food and should NEVER be used to can food. How do you know if you have a pressure cooker or a pressure canner? My gauge goes from 5lbs, 10lbs to 15lbs pressure. Does that make it a canner? I am unsure Pat because I don’t know what your device looks like. You need to look up the company that makes your device and see if it is for canning food for cooking food quickly. But based on your description, it sounds like a canner to me. Google it to double check. 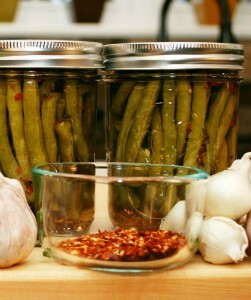 I used our flat top stove this year and canned 84 quarts of green beans. It was fantastic because after I brought down the temperature, I never had to fiddle with it to keep the pressure up like on the old coil stoves. Frigidaire ranges (check websites) are ok for canning. Awesome Andy! Thank you so much for posting. It is nice to know that Frididaire are okay. If I water bathed greenbeans 2 days ago.I was told 20 minuets boiling process time. We ate some last night and no one is ill can I put them back in a water bath and boiling them 2 hours and be safe? NO Tamme! That would NOT be safe. Even if you water bath them for 10 HOURS, they would NOT be safe. A boiling water bath never reaches a high enough temperature to kill the botulism spore. If they are not pickled, green beans absolutely MUST be pressure canned to reach an internal temperature of over 240 degrees. You could freeze them. That would be fast and easy. They would need be quick blanched (2-3 min) and then plunged into cold water, drained and packaged for the freezer. If you do not have a pressure canner, I would freeze. Do you recommend pressure canning on a smooth top range? Since the burners ‘cycle’ do you think you can maintain an even presure or temperature in the canner? What do you think? No, you cannot maintain a constant temperature on one, plus it can actually break the cooktop from the heat. Check your manufacturer’s manual, it may void your warrantee. Laurie is right. Pressure canning is not recommended on that type of cooktop. Thank you for the quick precise info on these processes. One thing you might want to mention to is that there are several people (older generation) that can in the oven. This is NOT safe. Also THANK YOU so much for pointing out that a pressure cooker is not a pressure canner. Oh you are SO right Molly! The whole oven canning thing is really getting a lot of followers. It is dangerous and the USDA even put out a warning about it. But the other thing people are forgetting with that method is that it is not just about getting a seal. It is about killing the bacteria that cause spoilage AND ARE CARCINOGENS. Many of the molds are carcinogens and the oven method does nothing to stop them. The whole point of canning is to have a food that is safe to eat. I think I should write a whole post on what not to do. That would be wonderful! There are so many people wanting to can, but doing it improperly. Taking shortcuts, turning the jars upside down to “seal”, and oven canning will make people very sick or possibly die from it. Just because Grandma did it and got away with it, doesn’t mean that its safe. What about making fermented foods? Like kombucha and sauerkraut. I don’t “can” them, they sit out at room temperature for a number of days, then I put them in my fridge. I’ve never heard of botulism in fermented foods. You cannot get botulism from fermented foods because of the salt and the fact that fermentation creates lactic acid. That keeps botulism at bay. Botulism is only an issue when you seal up a low acid food in a vacuum (anaerobic environment). Low acid + anaerobic = botulism. You have neither of those factors with fermented food. I’m trying to figure out if dandelion greens are safe to ferment into a different version of sauerkraut then just the original cabbage. Is it safe and do you have a recipe for it? I don’t see any problem with fermenting dandelion greens. It would be safe as long as you used a standard amount of salt from whatever fermenting recipe you are adapting. The salt is what keeps it safe. I’m sorry I don’t have a recipe for it and I’m not sure how it would turn out. But it’s worth a try, so go ahead! Great article! Definitely one to share with our canning members. Many are getting into pressure canning and most are either nervous or scared altogether, This article will at least help curtail some of those fears. Thanks Mike. I definitely need to post more on pressure canning. I see the same fears. Glad you like the article!